When Marshall McLuhan died New Year’s Eve 1980, the University of Toronto lost a man they found slightly embarrassing. In the view of university administrators, McLuhan’s Monday night seminars on culture, technology and media had become more cult than curriculum. His exalted status as one of the great minds of the era had reached no higher than a cameo appearance in the Woody Allen movie, Annie Hall. He wasn’t merely an academic observing the media. He had become a media star. That was unforgivable in university circles. And then there was all that Catholic stuff — his musings on the effect of microphones on the liturgy, etc. On his death at age 69, the university immediately closed McLuhan’s office and classroom in the coach house, which had become a centre of interdisciplinary studies in media. The administration mocked students who protested the move. 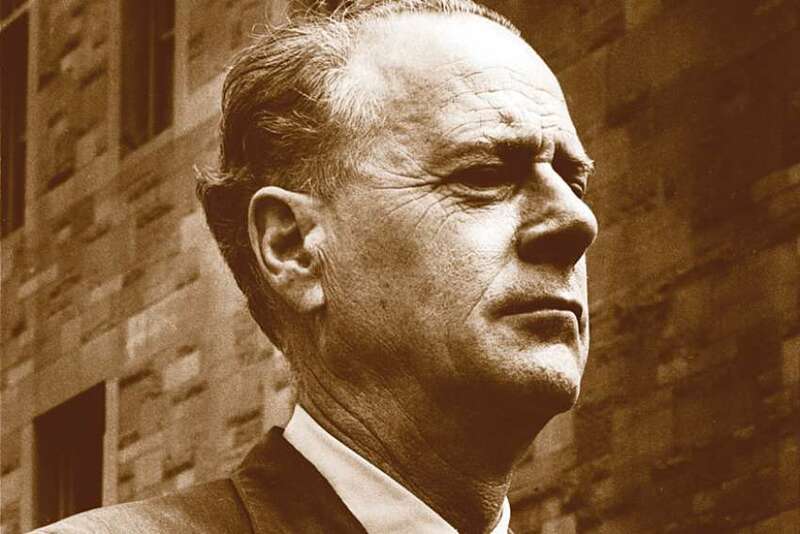 McLuhan’s son, Michael, recalls that his father endured more than his share of “academic jealousy.” There was, after McLuhan’s death, almost a campaign “trying to keep him from being taken seriously,” said Michael McLuhan. At an event Oct. 13, the University of St. Michael’s College emphatically reclaimed McLuhan and recognized his status as a towering figure in the 164-year history of the Catholic college, where McLuhan had been a faculty member since 1946.
Who wouldn’t want to be associated with the man who predicted the Internet 30 years before it happened? The final rehabilitation of McLuhan at the school involves an exhibition on his life and work at the John M. Kelly Library of St. Michael’s College, on display until Dec. 20. St. Michael’s kicked the exhibition off by elevating René Cera’s interpretation of McLuhan’s thought in the painting Pied Pipers All — the canvas had once served as backdrop to McLuhan’s Monday night seminars at the coach house — to a central location on campus in the Canada Room of Brennan Hall. Georgetown University’s Paul Elie delivered a lecture on “The Makings of a Spirituality of Technology: Glenn Gould, Marshall McLuhan and ‘Electronic Participation’” after Cera’s painting was unveiled. That there is a spirituality to McLuhan’s work should surprise no one. “His faith was absolutely inextricable from who he was and what he did,” said Michael. This is a misleading view . “Slightly embarassing to the University” Well at 65 McLuhan was officially retired as that was the policy in effect at the University. Why was he still there? Because the University wanted him there! As far as being a media star can anyone doubt that by 70’s the University did not seek public recognition? That objection ought to be put to rest. The closing of the Centre? De Kerchove and Olsen were up and running at least by ’83 less than 2 years after McLuhan’s death! “The Catholic stuff,” and “the University of St. Michael’s College emphatically reclaimed McLuhan” is a sad irony. In the wake of McLuhan’s passing the college had an opportunity to reclaim McLuhan and the University would have granted that. At best hanging Pied Pipers is an enhancement best labled too little and too late.